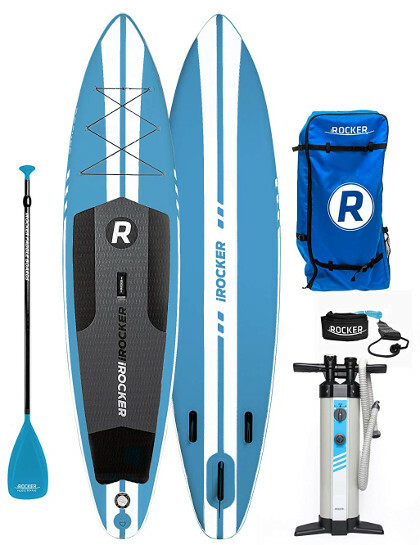 iRocker have invested so much time and effort to come up with a brilliant line of inflatable standup paddle boards that covers the largest costumers’ platform possible with all their different needs and skill levels. And with a two years warranty, you’ll get to enjoy a great paddling experience on any of their iSUPs. As for this review, you’d know a good iSUP when you spot one, and that’s what happened when I first saw the SPORT by the iRocker. The least I could say about this board is that it looks so much like an authentic board; it could confuse anyone looking at it. I mostly loved the sleek design given to it; it’s sharp and sporty as the name clearly suggests. But that’s not everything; that’s why we’ll try to cover every bit of what’s important to know before you make your order. SPORT is a big guy; it is 11 feet long, 30 inches wide and 6 inches thick. You’ve got to love it. 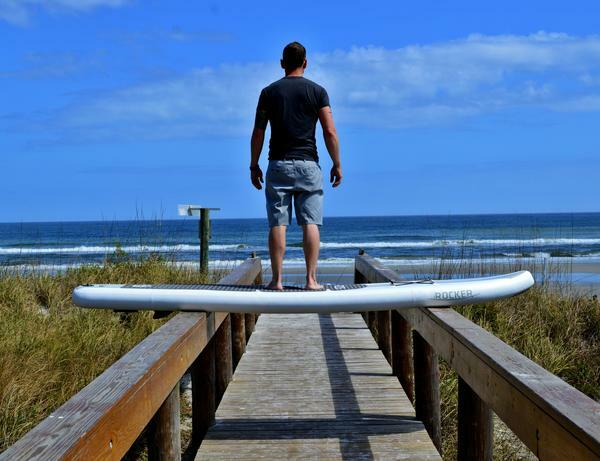 The length factor contributes immensely to the board’s performance; 11 feet screams the fact that the SPORT is meant for riders with intermediate to advanced skill-level who are aiming to have a speedy paddling experience. Also, it’s important to mention that iRocker has wider boards (up to 32 inches wide like the All-Round or up to 33 inches wide like the Cruiser) which seem to be a better option for beginners. Moreover, and even though the SPORT is meant to target speed, the company did not ignore the necessity to assure the highest level of resistance giving the board a 6 inches thickness; it’s going to be nearly impossible to make this board sink down even when it reaches its weight limit (385 LBS). iRocker presents their products as virtually indestructible which is nothing less than true. The SPORT is made of the strongest materials to ever be found on the market; the famous triple layer military grade PVC and drop stitch. It’s tough from tip to tail and from rail to rail. It definitely doesn’t mean that you can go maniac-mood on your board; but you can definitely treat it with a little harshness without it getting harmed or damaged. Once fully inflated, the SPORT will resemble a hard board and it’ll also feel like it; it’s rigid, strong and extremely durable. I need to draw your attention here to the amazing effort made by the people behind iRocker to put the pieces of each board of theirs together to make them seem and feel like one large leaf once in the water. It’s something to be appreciated given the fact that it’s an inflatable product. The thing about iSUPs is that they add a lot more practicality to this friendly water sport; you can pack and store your inflatable board anywhere as you also can take it with you anywhere since it’s extremely easy to transport. The featured qualities on these boards make them quite the deal, and this is what you’ll find on the SPORT. I always like to start with the diamond grooved EVA foam traction pad because it’s something you’ll only find on iSUPs. This pad makes the board a lot harder and a lot more rigid. It covers half the board’s back and it’ll prevent your feet from ever skidding off the board. The SPORT is also featured with 9 D-rings; 4 of which are on the board’s front and are attached with a bungee cord to secure your items to the board. Another 4 D-rings are on the sides of the board so you can use a kayak seat. The last D-ring is on the board’s tail as to attach a leash to it. A central carry handle that is extremely rigid and that’ll allow you to carry the inflated board with one hand even though it is 11 feet long; it’s padded with a rubbery material for more comfort. The navigation system consists of three fins; one of which is large and removable, while the other two are smaller and fixed. Those fins are known for making a huge difference when it comes to tracking and speed. TIP: always put the board’s tail in the water first and make sure the fin doesn’t reach the ground before you get on the board. A dual action hand pump with a pressure gauge. With what we can call a pointy nose and the trapped tail; the SPORT is designed with a sleek body to minimise drag while cutting through the water and to make the best out of your body weight. It’s a fast board in flat water, as it is really responsive. Not even for once that I had to struggle with changing directions or performing some swift maneuvers; on the contrary, it was so much fun as the balance was quite impressive for a 30 inches wide board. I believe that anyone can get full control over the board after using it couple of times; it’s responsive, it has good balance and it’s fast. The SPORT is a fast and stable iSUP in flat water. It’s highly functional even in choppy water. It comes in an all-inclusive package. It’s rigid and extremely durable. It has one of the sleekest bodies made to cut through water easily and swiftly. If there is anything to point out at all, it would be the fact that the SPORT comes a little on the heavy side; it’s 30 LBS which for some of us might be a little hard to handle especially if you’re planning on walking or moving a lot. All in all, for such a decent price, the SPORT is a great board.